Despite these challenges, academic labs still need to safely manage chemical waste generation and disposal. Failure to do so could result in serious injuries, fines or other penalties, and damage to the reputation of the institution. There are a few things academic labs should be aware of when disposing of chemical waste. The Environmental Protection Agency (EPA) uses RCRA to control generation and disposal of hazardous waste across all industries. This rule defines hazardous waste producers as Large Quantity, Small Quantity or Very Small Quantity. Each category has its own requirements. Waste generators must dispose of chemical wastes at certified hazardous waste disposal sites. Labs don't easily fit into the standard RCRA criteria; therefore, the EPA introduced a special rule for academic labs – 40 CFR Part 262, Subpart K.
Subpart K specifies that experts, not students, must identify hazardous waste materials. Universities can decide where to dispose of hazardous wastes, as long as it’s removed every six months. Old or expired chemicals must be removed per lab standards, each year. The rule also requires a Laboratory Management Plan that includes the best waste management practices. Be careful when mixing chemical wastes. Some chemicals react with each other, causing a potential safety or fire risk. Always adhere to OSHA and NFPA flammable liquid regulations. If possible, replace toxic or hazardous chemicals with a non-toxic alternative. It is safer not to have a hazardous chemical in the lab at all than to control its storage and use. Keep spill kits accessible for cleaning spills immediately when they occur. Control access to chemical waste storage to prevent unauthorized access. 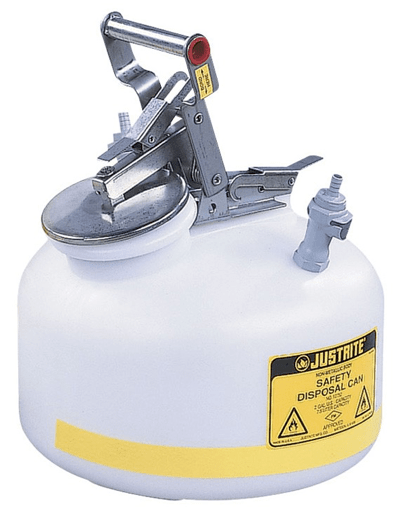 Chemical-resistant, HDPE liquid disposal safety cans are suitable for storing most hazardous chemical wastes. The spring-loaded sealed cap prevents spills and acts as a pressure relief valve. A large mouth opening allows for easy pouring. Collect waste from several HPLC machines at once with HPLC safety disposal cans. Quick disconnect fittings automatically close the valves when disconnected, preventing vapors to escape into the air. A flame arrester resides in the pouring spout to prevent flash back ignition when emptying. 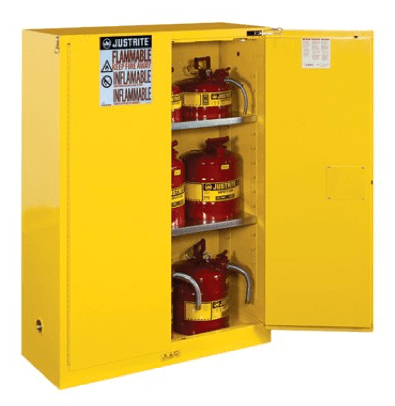 Justrite Sure-Grip EX safety cabinets meet the requirements for flammable liquid storage. They have a double wall steel construction with an air gap for fire resistance. Self-latching doors ensure the contents remain secure in fire conditions. RELATED ARTICLE: Be Careful with That Hazardous Waste! 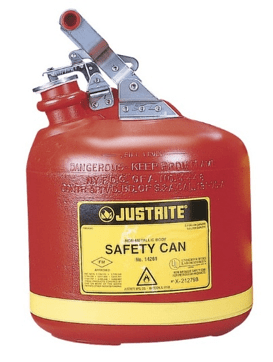 Justrite supplies products and services to help keep academic laboratories compliant and safe in terms of chemical waste disposal. Our experts offer advice for your particular application. Browse all of our lab dispensing containers, lab HPLC disposal containers, and lab chemical safety cabinets.